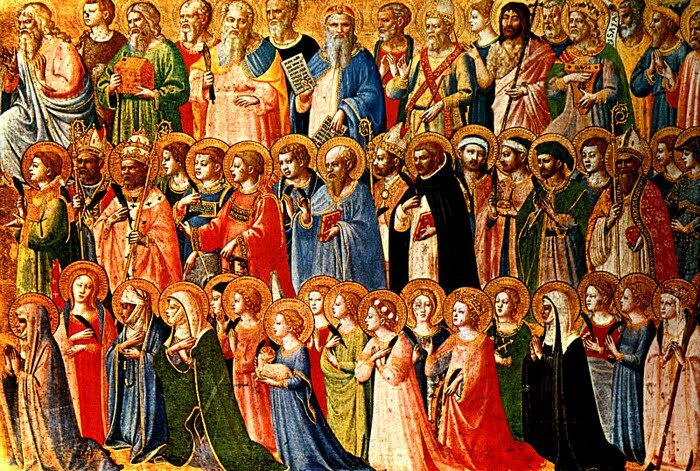 "surrounded by such a great cloud of witnesses..."
Next Wednesday, 1 November, is the Feast of All Saints, which we will celebrate again on the following Sunday. All Saints is the only feast the Book of Common Prayer allows us to celebrate twice - first on the day itself and then again on the next Sunday. As you might imagine, different traditions within Christianity have very different ideas about this feast and its meaning. Even its history within the ancient Church is hard to pin down. The date itself has moved around throughout the centuries, when at various times it either sought to compete with or be separated from other pagan festivals and celebrations. Once the day was finally settled, in the eighth century, All Saints became a part of what is known as "Allhallowtide," a three day celebration that begins with the Vigil on All Hallows' Eve (yes, that's where Halloween comes from) through 2 November, All Souls' Day. The distinction between All Saints and All Souls is often blurred in American Christianity because it involves the doctrine of Purgatory, one which many Christians find troubling. All Saints Day is the commemoration of those faithful people - famous and not - who have entered into heaven and attained what is known as "the beatific vision" - that is, seeing God face to face. In technical "church speak" this is what as knows as the "Church Triumphant." All Souls remembers the faithful departed who are still in Purgatory, completing that process of sanctification and awaiting the entry into Heaven. This group is called the "Church Expectant," whereas we who are still in our pilgrimage on earth are called the "Church Militant." The Lutheran Church and many other protestants dismiss the doctrine of Purgatory entirely and so speak of the "two phases" of the Church, on earth and in heaven. Regardless of what one believes about Purgatory and whether there are three parts of the Church or only two, what is important is that we are all - living and dead - still part of the Church, part of the Body of Christ and not separated from one another by death. When we pray or worship here on Earth, we are joined again with those who have gone before, particularly so when we come to the altar at the Eucharist and share in the body and blood of Christ. There is an exquisitely beautiful portrayal of this moment in the 1984 movie, Places in the Heart. If you haven't seen it, you should. "Yet she [the Church] on earth hath union with God, the Three in One, and mystic sweet communion with those whose rest is won. O happy ones and Holy! Lord give us grace that we, like them, the meek and lowly, on high may dwell with thee." At St. Michael's this year, we begin our celebration of All Saints on All Hallows' Eve, Tuesday, 31 October at 6:00pm, in the service of Evensong. This is a sung version of Evening Prayer and is one of the most lovely services of Anglicanism. The choir has been working hard to get ready, and i hope you will join us.